Where to start with this review? I enjoyed this book, which can be a hard thing to say regarding it's subject of teen depression and the contemplations of suicide that it contains. But I think this novel is important. It's Leonard Peacock's eighteenth birthday and he's had enough of it all. He's had a hard time of life ever since the change in his former best friend changed both their lives and who continued to torment him relentlessly. There are only four people in the world he will be sorry to say goodbye to, and his parents are not included in that - neither of his absentee parents realise what Leonard's life is like or even what sort of person he is. His four friends are the only ones who have made him think that maybe he's not weird and sad, so he wants to thank them. But to him they are not enough to keep him here. Leonard's story is heartbreaking. What's even worse is there are so many teens who feel the same way as he does. Quick has shown in a touching, mature and accurate way how people like Leonard think and feel, even when it's for reasons they can't explain. However, I also feel as if Leonard does his classmates and even fellow humans a disservice by assuming they are all 'ubermorons' and none of them have a clue about anything. They may not have a clue about Leonard, and that is sad, but Leonard differs from Charlie from The Perks Of Being A Wallflower in the way that Leonard can't imagine anyone can possibly feel the way he does, while Charlie wonders about how other people really feel. 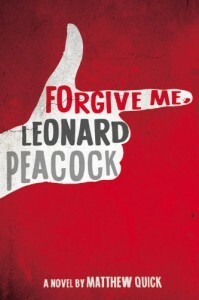 Leonard has every right to feel how he does, but at the same time he thinks he is the only one who does. He's not alone, and it's sad that he doesn't realise how most other people hold within them self doubts about themselves and their futures, and many people have felt some sort of abuse, although it may not be the same as Leonard's. I felt the turning point came when Leonard was sitting outside Asher's window and took some responsibility for what had happened in their past. What happened was not at all Leonard's fault, but he realises he could have done something about it and maybe saved both of them, all of them. Leonard's life can have a purpose if he fights for it and gives it one. There is an important message within this book, one that I hope is delivered to everyone, but also to the right person at the right moment. I hope that Leonard gets the future he writes about. Another fantastically written book by Matthew Quick that I couldn't put down.